Construction workers finish a new sidewalk on Thursday in front of businesses along Gov. Trimble Place in Hillsboro. A “green space” being constructed in what used to be the westbound lane of Gov. Trimble Place in Hillsboro is expected to be finished next month, according to Hillsboro Safety and Service Director Mel McKenzie. Construction workers on Thursday finished a new sidewalk in front of businesses along the north side of the street, including The Times-Gazette. The next step for contractors, according to McKenzie, is to install a curb along the eastbound lane of Trimble where the westbound lane was excavated. McKenzie said that should be done in the middle of next week, after city workers install new light poles along the street. Contractor crews will then haul in rock and sand to fill in the excavated area, and add pavers, sod, tables and planters to complete the area. McKenzie said workers on Wednesday accidentally damaged a water line while tearing out asphalt in the area, cutting water service to portions of the block, but crews had the break repaired within the day. According to McKenzie, when the street reopens, it will be a one-way thoroughfare allowing only eastbound traffic. Parking spaces will remain the same, he said. McKenzie said his top priorities this summer are completing the green space and constructing a “pocket park” in the empty Colony Theatre lot on North High Street. McKenzie said that project, which will include a light metal facade mimicking the old theater marquee, will likely have to be bid out rather than completed by city workers. McKenzie said he hopes it will be complete by the end of September. Legal matters are still pending for a fountain set to be placed on the courthouse square at the intersection of North High Street and West Main Street, McKenzie said. The City of Hillsboro and the Highland County Commissioners are working on a maintenance contract agreeing that while the fountain will be on county property, the city will be responsible for its maintenance in perpetuity, McKenzie said. When the agreement is signed, members of the Bagshaw family will pay a contractor directly to construct the fountain, according to McKenzie. 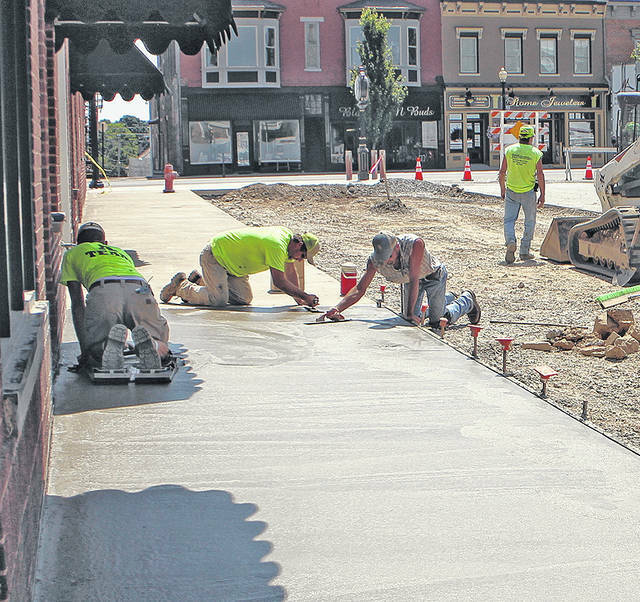 https://www.timesgazette.com/wp-content/uploads/sites/33/2018/07/web1_Greenspace-pic.jpgConstruction workers finish a new sidewalk on Thursday in front of businesses along Gov. Trimble Place in Hillsboro.